Attend to see a presentation on the tour, ask any questions & meet your facilitators. This is followed by a dinner party 6pm-8pm for India participants which you're invited to attend. Please bring a plate of food to share if staying. Free of charge. You'll take in spectacular visual landscapes and draw prana directly from nature; breathe and live amongst the aromas of the spice fields; indulge in the delicately balanced flavours of the cuisine; and discover solace and healing through the touch of your Ayurvedic therapists. You journey mindfully through space & time, clearing and creating an inner space of peacefulness, creativity and purpose. ​ We have planned a beautiful journey with a transformational focus. Everything is taken care of, nearly all costs included, to ensure you get the most from every moment. An immersive, sensory journey into the culture, spirituality and astoundingly beautiful and unique environment of Kerala in South India. Kerala is known for its extensive backwaters, nature reserves, coastal temples, historic ports and laid-back old cities, and Ayurvedic resorts. Start your journey in Cochin, the famous port city of the south where we stay in an incredible resort hotel on a private island looking over the harbour. A whirlwind exploration of the old city on foot and by bike, a cooking class with a 5 star chef, sunrise yoga on the harbour grounds, and more. Come a day early to enjoy the truly beautiful and luxurious Vivanta by Taj Resort. We drive inland and up into the balmy hills where we stay at a peaceful, luxurious sanctuary at the top of a hill amidst the forest canopy Thekkady. Here we walk through the spice fields and take a boat tour through the Periyar Tiger Reserve at sunset, then spend a day in beautiful nature hiking and rafting through the reserve amongst the tigers, elephants and wild animals. We have a whole day here at our amazing hilltop resort with its incredible vista for yoga, rest and a hike through the forest. From here it’s another spectacular drive through rolling hills and spice plantations to Alleppey where we embark our luxurious houseboat for a tranquil night drifting through the tropical backwaters, in the early evening canoeing to small villages along tiny canals. Then it’s on to the traditional Sivananda Ashram for a 4 day Yoga and Meditation Immersion in this gorgeous ashram on the banks of Neyar Dam for a program with a focus on the 5 points of Hatha Yoga - asana, pranayama, relaxation, meditation and diet. It’s not far to our final destination Soma Manaltheeram Ayurvedic Village set on a clifftop overlooking a private beach. Here you’ll experience a full 7 day Ayurvedic healing program to revitalise, cleanse or address specific health concerns - tailored for you by a team of doctors, therapists and chefs at India’s first and best Ayurvedic Resort. On our final full day together in India we drive down to Kayakumari, India’s southern most point and a sacred pilgrimage site with its temples by the sea where 3 oceans converge. We take a boat to the temple where we meditate in a manmade cave under the ocean at the very spot where the great sage and philosopher Vivekananda became enlightened. After lunch, we head back to our resort for a restful sleep before our journey home the next day. Every morning and every afternoon/evening you'll be guided in healing meditation, pranayama and hatha yoga in astoundingly beautiful locations. An opportunity to go deep, to learn more and to come to know, accept and love all those aspects of self that make you uniquely you. This tour will be led by Mandy from Kookaburra Yoga who has designed and facilitated our yoga retreats and journeys to India for over 10 years, along with local guides, scholars, mystics and masters who will guide you on an unforgettable and life-changing journey through the sublime physical landscape of South India, the healing modalities of Yoga and Ayurveda, and the inner landscapes of indriya (senses), manas (mind), buddhi (innate intelligence) and ananda (bliss of an unburdened soul). A journey designed to truly rekindle your love of life, replenish your life force and support optimal, vibrant health. You’ll emerge with a lighter heart, renewed energy and enthusiasm, clarity and purpose. We include here on our website the full itinerary, costs & inclusions and a facts and questions section. If you have any questions send an email to Kookaburra Yoga and we're happy to help. On arrival, you'll stay in a 5 star hotel at Port Kochi. Staying in a luxurious, serene resort on a spice plantation with spaces for meditation and rest. 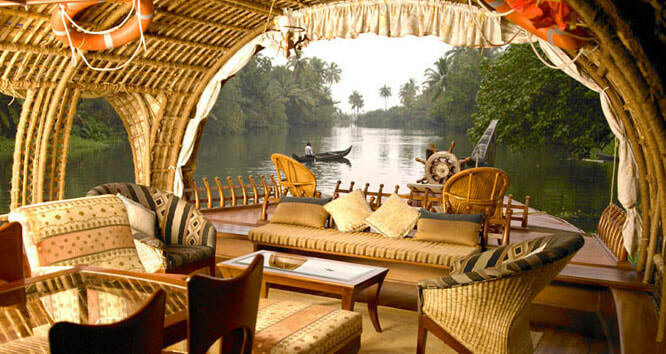 You'll explore the backwaters by houseboat spending a night on a deluxe houseboat. And then it's to Sivananda Ashram in the heart of the backwaters for a 3 day yoga and meditation intensive. Soma Manaltheeram is your home for 8 nights where you stay in a/c cottages overlooking a private beach. A week of Yoga, Meditation & Ayurveda - healing foods, rejuvenation, daily yoga and meditation. ​W H Y J O I N U S? Mandy BeckerKnox and Robert Becker lead the Kookaburra Yoga Journeys in India. They have visited India many times and have led international retreats for over a decade. They have decades experience teaching yoga and meditation and are skilful group facilitators. They have both worked in senior leadership positions and know how to respectfully and intuitively guide and support people to realise their full potential. This retreat is a cultural and spiritual immersion. The program is focussed on the transformational practice of hatha and raja yoga, meditation and Ayurveda. You will learn and practice methods from these disciplines everyday and will be guided and supported to identify and release inner obstacles and past karma, creating an inner freedom and peace - reflected in the magical landscapes. We start each day at sunrise with Mano Yoga - a powerful healing meditation practice. At sunset we practice Raja Yoga meditation and pranayama. In the evenings you'll be lulled into a deep, blissful state of relaxation during guided healing meditation. During our stay at Sivananda Ashram you'll experience a deep and immersive meditation intensive. Ayurvedic medicine (“Ayurveda” for short) is one of the world's oldest holistic healing systems. It was developed more than 3,000 years ago in India. It is based on the belief that health and wellness depend on a delicate balance between the mind, body, and spirit. You'll experience a 7 Day Rejuvenation Program to build health, resilience and vitality. Kerala, historically known as Keralam, is often referred to as 'God's Own Country and is India's most relaxed and beautiful state - with its serene beaches, tranquil stretches of backwaters, exotic wildlife, waterfalls and lush hill stations.The beauty and stillness of the landscape settles into your heart and soul - you will never forget it! You will stay in incredible, carefully chosen venues on this retreat including an ocean front 5 star hotel, an Ayurvedic coastal resort comprised of traditional cottages by the Arabian Sea, a deluxe houseboat, a 5 star resort in the hill station of Thekkady, and also a comfortable, but more basic traditional ashram. You are travelling a long way for this retreat and we believe its important to experience the sights, sounds and sensations of this diverse country of contrasts, to learn about its culture and open our hearts to its beautiful and very generous people. We include tours, adventures and excursions to counterbalance and soften the deep retreat process. All food on this retreat is fresh, mainly organic and vegetarian. On our houseboat and in hotels, you'll have the option to have local seafood i you choose to. At the Ayurvedic resort, you'll receive a personalised diet plan from your Ayurvedic doctor and can eat specifically for your unique constitution. At our Ayurvedic Resort you'll have afternoons free to deeply rest in your own hammock or by the pool or to explore. The resort is set amidst lush tropical gardens with a path meandering down to a private beach with dedicated lifeguards. Within walking distance is a traditional fishing village, marketplaces and temples. We take the time to engage with our hosts and participate with local communities to learn about and experience the history, culture, religious and spiritual traditions, customs and artforms. Daily Ayurvedic treatments include massage, saunas, herbal body wraps, shirodhara (oil over forehead) and more. To enter India you need to obtain an entry visa. Visas must be organised in advance in your own country. For anyone travelling from Australia this must be done online in advance of the retreat. Visit http://www.vfsglobal.com/india/australia/ for more information and to apply online. You must book your own international flight to arrive at Cochin on the 7 April or before. You will need to arrive at Cochin International Airport (COK). You will leave from Trivandrum so therefore your return flight should be booked departing from Trivandrum International Airport (TRV) on 26 April or afterwards. Both airports are international so you should easily find flights directly to and from these airports. Book flights as early as possible to secure a good price. We usually fly Singapore Airlines and have never had an issue with this airline. You are welcome to book with the airline of your choice. You must have a travel insurance policy with relevant inclusions and provide us with your Certificate of Currency prior to departure. You should organise travel insurance at the time of booking international flights to ensure you are covered in the event you need to cancel. ﻿Why choose Kookaburra YOGA FOR YOUR RETREAT? Established, reputable business. Kookaburra Retreats are offered by Kookaburra Yoga which is owned and directed by Robert Becker and Mandy BeckerKnox in Perth, Australia. Kookaburra Creek Yoga Centre is well established having been operating for twenty years. High quality program. Directors Mandy and Robert facilitate Kookaburra Yoga Retreats. They are both exceptional yoga and meditation instructors with decades of continuing education, self-enquiry and practical teaching experience. They have literally taught thousands of people yoga and to meditate and how to effectively apply the knowledge gained to enhance and transform lives. We welcome anyone who is interested in embarking upon a journey of self enquiry and discovery to attend this retreat. The yoga and meditation practices on each retreat are carefully explained and taught in a caring and respectful manner. All of the practices taught can be adapted to suit the needs of each participant and you always have the option not to participate in all the programmed sessions and activities. The Ayurvedic Healing component of the retreat doesn't have any prerequisites - just a desire to be well! You must book your own international flight arriving at Cochin. You will need to arrive at Cochin International Airport (COK). You will leave from Trivandrum so therefore your return flight should be booked departing from Trivandrum International Airport (TRV). Both airports are international so you should easily find flights directly to and from these airports. We usually fly Singapore Airlines and have never had an issue with this airline. You are welcome to book with the airline of your choice. You must have a travel insurance policy with relevant inclusions and provide us with your Certificate of Currency prior to departure. This is a condition of attending all international Kookaburra Yoga Retreats. You should organise your travel insurance at the time of booking your international flights to ensure you are covered in the event you need to cancel. We ask for a deposit of $600 upon booking a place on each of these Retreats. extra night's accommodation before and after tour; single room supplement, additional Panchakaram program. These options can be selected when booking and will be added to your final invoice if you select this option when booking. BOOKING: $600 DEPOSIT. Payable to Kookaburra Yoga. Deposit is non-refundable. 1st JANUARY: $1,400 2ND PAYMENT DUE. Once you have booked and paid your deposit, you'll soon receive an invoice for 2nd payment to be paid to Kookaburra Yoga by direct deposit or credit card. IMPORTANT 1st February is cut off date for cancellations without penalty. If you cancel before 1st February balance of payment is refundable (everything other than deposit). If you cancel after 1st January but before 14 February, 50% of amount paid is refundable. After this date refunds are not possible as we finalise all payments to our Indian agent and providers on this date. Ensure you organise insurance as soon as you book. Your insurance policy should cover you in the event you are unable to travel or need to cancel due to unforeseen circumstances. Please check with your insurer. If Kookaburra Yoga cancels this retreat all monies paid will be refunded within 30 days. Kerala is hot during the days reaching temperatures of up to 32 degrees and warm in the evenings with lows of about 24 degrees (celsius). The weather should be dry, with the monsoon season starting later in May or June. Clothes should be suited to this type of weather. You can purchase light cotton clothing in the marketplaces. When visiting temples, and in fact any public places, dress should be conservative with legs and shoulders covered. Bring bathers for swimming. While there are no issues in hotel pools and othe pool and private beach at our retreat centre, if swimming in public places, modesty is essential and a sarong or tshirt over your bathers is recommended for women. For yoga, wear whatever clothes you are comfortable to move and stretch and sit in. We recommend bringing or buying a shawl for meditation, and you will need mala beads for meditation which can be purchased at the marketplaces. 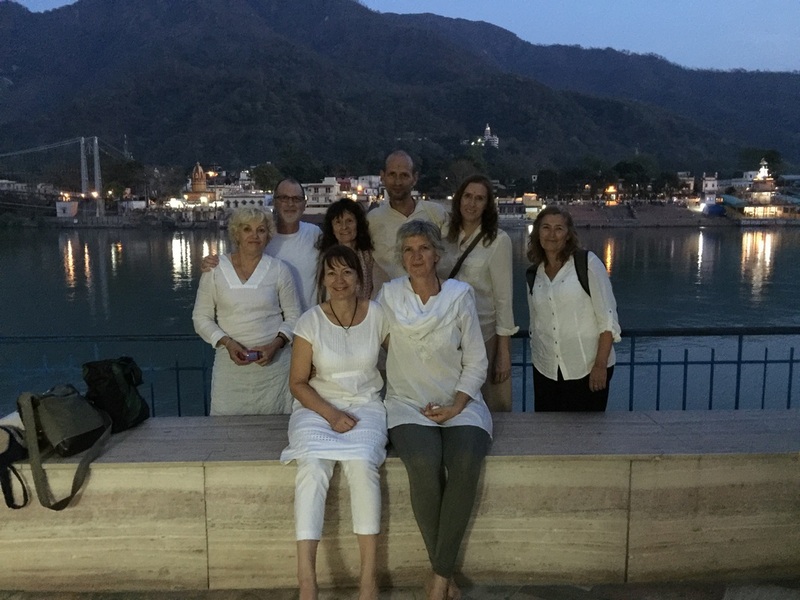 During the ashram stay you are required to wear white and pale coloured modest clothing, even during your hatha yoga practice. Mosquitos will be an issue in the evenings, so loose, long cotton clothing is ideal. You may have practiced or even taught yoga for many years in your home country and be ready to take the next step - to experience yoga at its source. ​We'd love you to join our retreat for an immersive, fully supported Indian experience. Yoga in India has changed over recent years with a proliferation of 200 hr yoga teacher trainings and retreats varying in quality and authenticity. We encourage you to be discerning, to be safe, and select a program and organisation which nurtures and supports every aspect of who you are. Even if you don't travel with Kookaburra Yoga, we are happy to share our knowledge and experience to assist you to enrich your travels and yoga education - just be in touch!